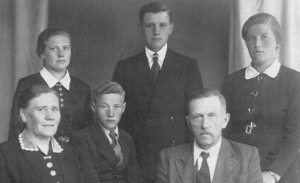 [[File:1946PeterLetkemann.jpg|300px|thumb|right|''Peter and Aganetha Letkemann and family, 1946'']] Peter J. Letkemann, minister, teacher and farmer was born 12 August (31 July according to the Russian calendar) 1886 in [[Osterwick|Osterwick]], [[Chortitza Mennonite Settlement (Zaporizhia Oblast, Ukraine)|Chortitza]] Mennonite Settlement, [[Russia|Russia]] to Jacob and Katharina (Harder) Letkemann. In 1908 he married Helena Sawatsky, and after the death of his first wife in 1922, he married Aganetha (Friesen), widow of Johann Penner of Schönhorst, Chortitza Mennonite Settlement. Schapansky, Henry. "Letkemann, Peter J. (1886-1966)." Global Anabaptist Mennonite Encyclopedia Online. 2002. Web. 25 Apr 2019. http://gameo.org/index.php?title=Letkemann,_Peter_J._(1886-1966)&oldid=92443. Schapansky, Henry. (2002). Letkemann, Peter J. (1886-1966). Global Anabaptist Mennonite Encyclopedia Online. Retrieved 25 April 2019, from http://gameo.org/index.php?title=Letkemann,_Peter_J._(1886-1966)&oldid=92443.